The eight chapters in this book deal specifically with periodontal treatment addressed from a clinical viewpoint, with detailed descriptions of the various nonsurgical and surgical procedures. Scientific evidence and data from the literature are carefully considered. Numerous clinical photographs are accompanied by explanatory drawings that thoroughly describe the various clinical procedures. 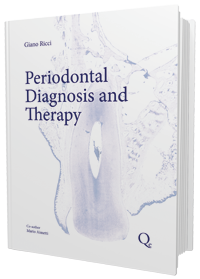 The book is intended to help both young clinicians who are approaching periodontology for the first time as well as more experienced clinicians who wish to broaden their knowledge in the field of periodontal therapy.